Helping to create Africa’s future is not just business for Sandra Malaika, it’s personal. Malaika was born in Kinshasa, the capital of the Democratic Republic of Congo. Since moving to Rwanda at age 12, she has regarded Kigali as her home. With an interest in education, she earned a bachelor’s degree from the Kigali Institute of Management and a master’s degree from Andrews University in Michigan. She now uses her experience and skills to impact African youth across the continent. “The vision for Carnegie Mellon University Africa is to educate the next generation of tech leaders of Africa, and I want to be an integral part of that,” she said. Malaika is program manager of the Mastercard Foundation Scholars Program at CMU-Africa, which offers master’s degrees in information technology and electrical and computer engineering. The scholars program provides quality education and leadership development to academically talented students from sub-Saharan Africa with potential for leadership and a passion to give back to their communities. Malaika recruits scholars to the program, processes student applications, coordinates and creates content for orientation, and manages the program’s budget and expenses. She also organizes student activities and community outreach efforts and helps counsel students on their careers by coordinating workshops with industry professionals. “I want their experience to be enriching beyond the classroom,” Malaika said. This year, the program reached a special milestone when the first cohort of the Mastercard Foundation Scholars graduated. A lover of books and travel, Malaika reads everything, from the Bible, biographies and suspense thrillers, to books on leadership, foreign aid, African politics and history, and personal growth. She is married with a 6-year-old daughter and considers herself an explorer at heart, having traveled to Morocco, Tanzania, Dubai, Europe and the United Kingdom. One day she hopes to visit the Bahamas. “I love discovering new places!” she said. 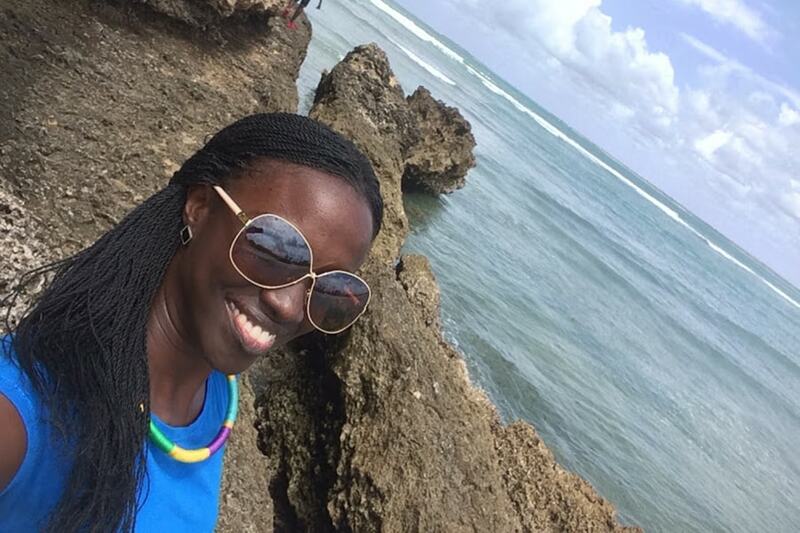 Sandra Malaika loves to discover new places, like this beach in Dar es Salaam, Tanzania.